New 8 Station “D” Tooling Rotary Tablet Presses, Model Mini II. Tabletop tablet presses capable of producing up to 15,000(32RPM) tablets per hour. Features: Stainless Steel product hopper, 1. 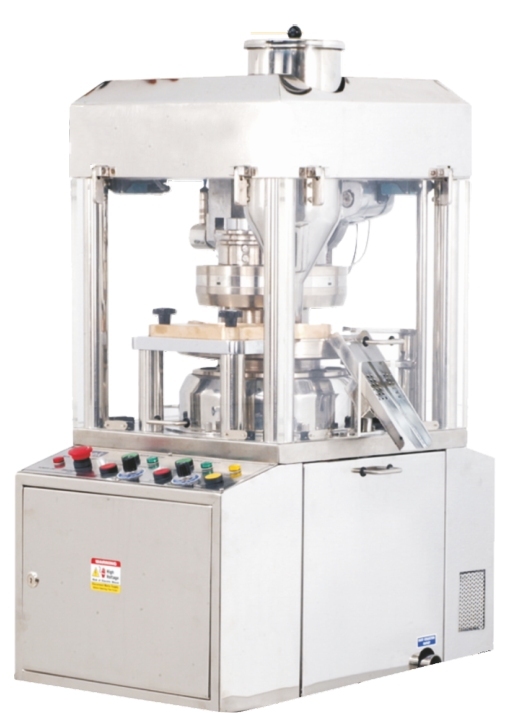 Set of Standard Tooling, Force Product Feed System, 2 Ton Maximum Pre-Compression, 6 Ton Maximum Standard Compression, Tablet Thickness, Weight Adjustment and Pressure controls are located on the front of the machine. Maximum Tablet Diameter: 23mm, Maximum Depth of Fill: 20mm. Comes with Interlocking upper and lower lexan guards, a 2 Hp, 3Ph/60Hz/220Volt drive, 1440 rpm and emergency stop buttons. Overall Dimensions: 18” L x 27” W x 43” High. 880 Lbs. Delivery Time: approx 8 weeks from receipt of 65% deposit.